Why: The 18 bedroomed Longueville House is situated within the estate. 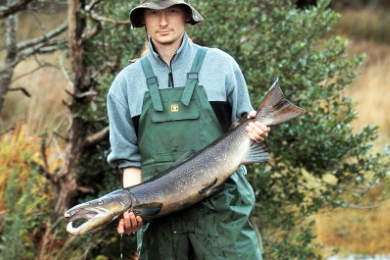 Why: You will be under the guidance of one of Ireland's most capable fishing guides. Why: A stay in the beautiful 12th Century castle makes for a very memorable experience on 420 acre estate within the islands of Upper Lough Erne in Co. Fermanagh. Why: The setting is the epitome of beauty and the incredible salmon runs are known throughout the world. Why: The river Laune rises in the world famous killarney Lakes, a short river of some sixteen miles. Fresh fish enter the river with every tide and it is a joy to take salmon on the double handed rod with a floating line and small fly. Why: A 2,000 acre estate situated in the foothills of the Sperrin mountains.